The Vikings are set to face the Rams. Join in on the discussion as Andrew Krammer, Judd Zulgad and others react LIVE during the game with #1500ESPNLive. #1500ESPNLive is an experience like no other. You will get instant commentary, opinion, analysis and reaction to what is happening on the field. Enjoy real time videos, photos, audio and posts from around the world via social media. I see Gregg Williams hasn't changed at all. #Vikings QB @teddyb_h2o is being evaluated for a concussion.
.@teddyb_h2o is being evaluated for a concussion. Bridgewater headed in to receive a concussion evaluation. Bridgewater being evaluted for a concussion. Tell me why this guy is the punter? Tavon in the open field! ???? A flag comes in for intentional grounding on STL's 3rd down incompletion. Wonder if Vikes punter was paying attention to that Rams' punt? The #Vikings have the ball on their own 11-yard line with 9:44 remaining in the game.
.@AdrianPeterson now with 20 carries for 83 yards and 1 TD.
.@AdrianPeterson has 3 carries for 28 yards to start the drive for the #Vikings . THIS IS THE drive the RAMS put it away..
Audie Cole down for the Vikings. Brandon Watts will take over for Cole. Brandon Watts in for Cole. wow, the whole HODGE trade is looking big at this point. 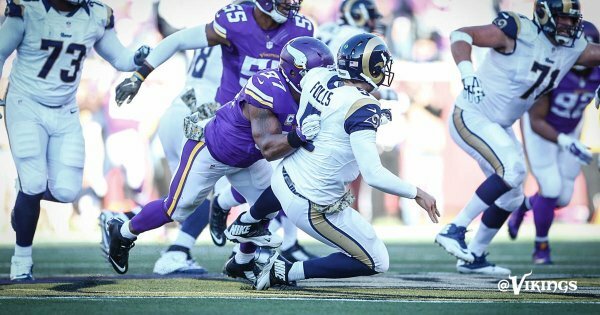 @judd, remember when vikings had depth ? then speilamn went and traded a starter for a backup no active lineman?